It was recently brought to my attention that the Geocentrists at "Galileo Was Wrong" (GWW) have actually attempted to meet my Lagrange Point challenge (Rick DeLano's original claim that geocentrism can explain Lagrange Points, and my specification of the challenge). Since this is a fairly straightforward analysis in a Newtonian and non-geocentric framework that undergraduate physics students are expected to do (and I have done it), you are required to prove that this analysis has been done in the physically geocentric model. Identify all five Lagrangian points using a strictly geocentric calculation with full mathematical detail FROM FIRST PRINCIPLES, i.e. the claimed geocentric physics behind it, presenting the equations of motion, etc. (Wikipedia - lagrange points). Post the solution on a web site and send me the link. The positional solutions must be identical to those found in Newtonian non-geocentric case and should properly identify the Lagrange points of the Earth-Sun system (STEREO @ L4 & L5, Sentinels of the Heliosphere at L1, WMAP @ L2), the Earth-Moon system (ARTEMIS at L1 & L2), and the Sun-Jupiter system (Trojan asteroids). Note that operating missions have made, or are making use of up to four of the five points. We've not yet found a good use for L3 points that warrants a visit. And no cheating - claiming that the result is the same as the non-geocentric case with a coordinate transformation to the geocentric frame is physically indistinguishable from the frame of reference designation - which can be done anywhere in the universe and makes all frames equivalent. There is no universal or physically preferred rest frame by this method on any scale less than the CMB. Note that one of the requirements of this challenge is that the analysis must be FUNDAMENTALLY in the geocentric frame. Doing the analysis in the the standard Newtonian framework and then translating to an Earth-centered frame does not qualify as this is a step that can be done for ANY point and so does not actually treat Earth as a preferred center in any absolute sense. 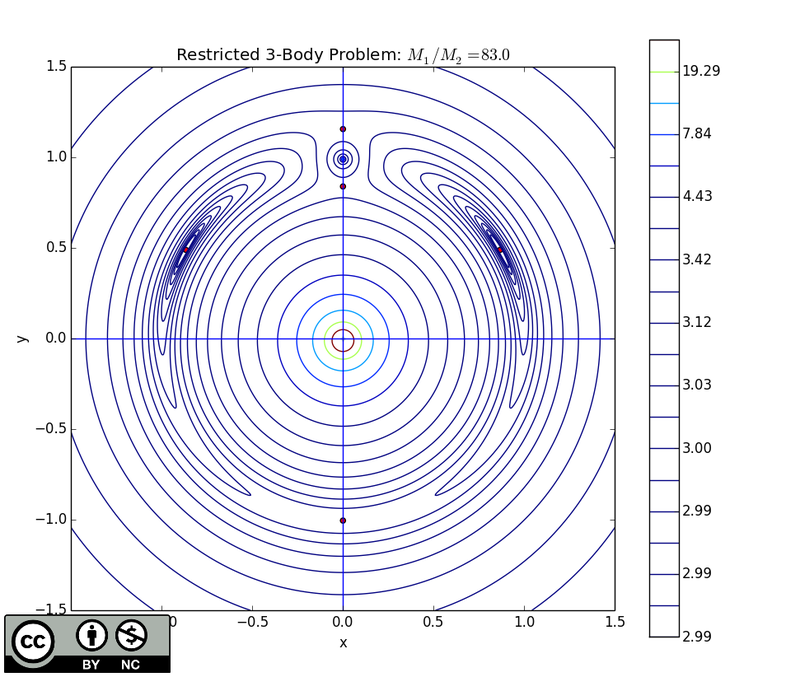 The original post at GWW is available here: "A Geocentric Solution to the Three-Body Problem" Prepared by Gerard Bouw, Ph.D. (last retrieved November 1, 2014. The file metadata show a creation date of July 18, 2014 and a modification date of August 7, 2014). While in the original challenge I requested that I be notified of publication of the document, I did not hear about it until a little later, from the folks at GeocentrismDebunked.org. On August 22, 2014, Dr. MacAndrew posted an examination of Dr. Bouw's analysis in Geocentric Physics: Is That All You've Got? I commend Dr. MacAndrew for his analysis. He exposed the flawed math in the first section, when Bouw tried to remap the physics into a rotating geocentric frame using the standard Newtonian analysis. Compare Dr. Bouw's math to that presented at Wikipedia: Centrifugal force (rotating reference frame). Dr. MacAndrew identified a serious mathematical error in the section. So far, there is NOTHING in this analysis that makes Earth a preferred frame in any absolute sense. Is a basic treatment that allows physicists to convert between inertial and rotating reference frames, whether they be rotating planets or rotating children's tops. Mapping of gravitational potential for a mass ratio of 10. Origin at center of mass. Mapping of gravitational potential for a mass ratio of 83 (=Earth/Moon mass ratio). Origin at center of mass. Note that I make these images Creative Commons NC BY. You can use them but they must be clearly credited with a link to the source document (this page). Kudos to Dr. MacAndrew who found the original text at archive.org, Archive.org: "An Introduction to Celestial Mechanics" 2nd Revised Edition by Forest Ray Moulton. Moulton's 2nd Edition is available as a Dover reprint. With the original source for comparison, we can explore just how much Bouw copied the original Moulton text. Bouw's equation system 13 are identical to equation 1 of Moulton. These are basically the Newtonian force equations written based on the RELATIVE positions between the three bodies. Pages 8-25 of Bouw are almost identical to pages 278-294 of Moulton. There are minor changes in symbols used, updating of some numeric formats in text, but for the most part, they are identical. This demonstrates just how blatantly Dr. Bouw copied the standard Newtonian treatment from the original text and without any citation. Without that citation, Dr. Bouw is presenting the analysis if it is HIS work, when it's pretty obvious that the only actual work Dr. Bouw did in this effort is some scanning, transcription, and copying the equations into an equation editor. If a student had been caught turning this in as part of a physics homework assignment, the instructor would certainly be justified in reporting the student for disciplinary action for plagiarism. Additionally, there is NOTHING in this equation set that relies on the existence of an absolute fixed location, such as Earth (as the Geocentrists insist). This analysis works with a 'center' as Earth (for the Earth-Moon Lagrange points), or the Sun (for Sun-Earth or Sun-any other planet Lagrange points). Sungenis responded to these with GWW: "David Palm Caught Falsely Accusing Opponents of Plagiarism" which included a response from Dr. Bouw about how he didn't see a problem as copyright had expired on the Moulton work. The issue is Bouw presented this material as not just a 'Geocentric' analysis (which it is not), but also as HIS OWN WORK, which it clearly is not, and which he now admits. No telling how long it would have taken for that fact to come to light if the source text had not been so conclusively identified. Expiration of copyright is not a license to plagiarize. By Dr. Bouw's interpretation, he could re-publish most of the works of Edgar Rice Burroughs under his own name and he would have done nothing wrong. The issue is this was presented as his own WORK. Mr. Palm quotes Tom Bridgman as saying: “Everything I’ve seen from Geocentrists is a cheat, trying to take someone else’s heliocentric solution and then moving the origin to the Earth.” Of course, we would expect an atheistic, evolutionist, Big Banger like Bridgman to picture it as a “cheat,” but in reality it is nothing more than showing the world how the same equations heliocentrists use to demonstrate the viability of their system can be used to demonstrate the viability of the geocentric system, which has been known ever since Mach and Einstein expanded on Newton’s equations. The geocentric derivations MUST employ the heliocentric equations, often point‐for‐point, since the geocentric is just the inverse of the heliocentric. There is no way to avoid this state of affairs, especially when one is trying to show the equivalence of the two systems. Sungenis invokes Mach & Einstein to bolster his poor position. But Mach and Einstein expanded on Newton's work, which expanded the concept of no absolute spatial reference frame to include time as well, and that reference frames and 'centers' can be chosen for the convenience of solving the problem at hand. The methodology defines NO absolute position. I wrote more on Geocentrists invoking Mach at Geocentrism: Mach, 'Aether Drag' and Aberration. The technique the Geocentrists use to get the 'geocentric' solution works just as well to do an areocentric (Mars-centered), selenocentric (Moon-centered), jovicentric (Jupiter-centered), kronocentric (Saturn-centered) or any other 'center' one wishes to define ANYWHERE in the cosmos. NASA uses these transformations routinely when sending spacecraft to other planets (see Geocentrism: Does NASA use Geocentrism?). Sungenis' excuse exposes Geocentrists' claims as indistinguishable from a personal preference (like a favorite dessert), or personal bigotry. So, contrary to the terms of my original challenge, AT MOST, all the Geocentrists have done is used the standard derivation using Newtonian gravity and force laws (which define no absolute position) and 'translate' it to a geocentric frame. Sungenis even admits this. In Newtonian mechanics, this trick works around ANY point, Earth, Moon, Sun, Mars, etc., contrary to Geocentrist claims of Earth being a special point in an absolute sense. As Jesus noted in Matthew 7:15-23, his followers will be recognized by their actions more than their words. Such explicit acts of deception are yet another reason I regard the Geocentrists and Young-Earth creationists as the 'wolves' which Jesus warned his followers about (see Creationist Junk Debunked). Update November 3, 2013: I've fixed a few minor typos and removed the 'Dr.' when referencing Sungenis. It's been pointed out to me that his doctorate (wikipedia) is from an unaccredited institution. 1. The first conceding that a straightforward calculation was performed to show the geocentric LaGrange points; though you may not be happy that it was done. 2. A second to deal with the attribution issue. The computation presented by Sungenis & Bouw is basically a COPY of the standard treatment which in itself defines NO preferred center. It uses Newtonian gravity as well as Newton's force laws, which define NO preferred center. It works equally well for Sun-Earth Lagrange points, or the Earth-Moon Lagrange points, or the Sun-Jupiter Lagrange points, or anywhere else in the universe by means of a simple coordinate transformation that also has NO preferred center, neither Earth, nor anywhere else. This is the standard way it is done. It fails to demonstrate Geocentrism in any absolute sense other than a point of convenience, only slightly more 'absolute' than a favorite dessert. All Sungenis and Friends did was CLAIM it was a specifically Geocentric computation with Earth as an absolute favored position, which it is not. In case it needs clarification, here's the definition of plagarism from the Yale College Writing Center.